With two birthdays one day apart, July is a busy month for our family. We have Jackie’s birthday on the 10th and Laura’s soon after on the 12th. And although sometimes we lump the birthdays together for one really big celebration, this year, we managed to have two nice dinners and two very different cakes. On Jackie’s birthday, our family went to our Korean food mainstay, Keum Ho Jung. Here in Edison we’re actually blessed with a huge variety of different ethnic restaurants and people are always discovering new places to eat, but we’ve been going to Keum Ho Jung for so long that it would seem at least a little strange if we didn’t go there for our Korean food fix. 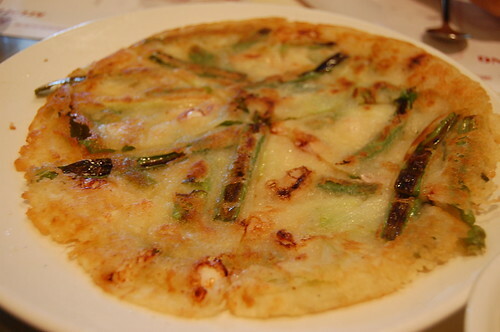 We ordered our usual picks – seafood pancake, jab chae, kal bi – as well as one new item, the squid dolsot bibimbap which packed a little heat and turned out to be quite tasty. And later in the evening, we celebrated Jackie’s birthday with a very unique mango mousse and sponge cake. A little too sweet and creamy for my taste, but the next morning before lunch, I caught the birthday girl taking giant spoonfuls right out of the cake itself…and her opinion was all that mattered anyway. Two days later, we stayed in to celebrate Laura’s 17th but ate just as well. We grilled some juicy hamburgers and a favorite of my dad’s, lamb chops. 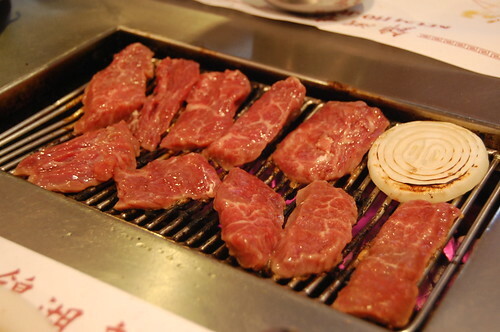 The preparation for these babies is very simple but brings out the flavor of the meat in the best possible way. We bought a frenched rack of lamb, which I then cut into 9 single chops. Mix extra virgin olive oil, sea salt (which is actually the only salt I use now), coarse black pepper, sliced garlic, and a teensy bit of Chinese five spice if you have it. Although the five spice flavor isn’t very pronounced in the end product, I do believe it adds a certain amount of depth. Don’t be scared to use liberal amounts of seasoning; the worst thing is bland meat. Marinate for 2-3 hours. Heat the grill pan to high and then sear chops, about 4 minutes on first side and 2 on the second depending on how you prefer them cooked. I always prefer medium-rare. Because of that initial sear on very high heat and the generous amount of seasoning, these lamb chops had a great caramelized crust on the outside but were still very tender on the inside. A friend also brought a huge vat of delicious Sichuanese-style noodles with those infamous flower peppercorns in the sauce. They were so addicting that I kept eating bowlfuls until my mouth went numb, which wasn’t helped any by the Carvel ice cream cake we ended up eating later. You are currently reading Double Birthdays at Notes on Food.